Dovetail Bicycles wants you to know that you can pack your bike any way you want, but I want you to know that’s it’s more fun to travel with less stuff. How is a “scrappy start-up” like Dovetail going to fare when I share the secrets of traveling light? Simple, lightweight compact goods that directly satisfy your needs are never excessive and will quickly become an essential part of your personal touring system. First, a small tent. The Man Tent does it. Minimalist summer sleep system, insulated jacket and hooded lounge parka. The Napsack will do. A small, reliable cook system. The Esbit alcohol/solid fuel hybrid stove. Efficient water transport. The 64 oz. Klean Kanteen is a full half-gallon and fits perfectly in the Salsa Anything Cage. And a useful eating utensil. I still don’t know about the spork, even if it is a fork and a spoon at separate ends and even if it is titanium. This entry was posted in Uncategorized by gypsybytrade. Bookmark the permalink. Liked your writing over on Dovetail. I’m trying to go as light as possible on my LHT this year after a four-month tour with “the works”. Though it seems like I like a few more luxuries than you do. 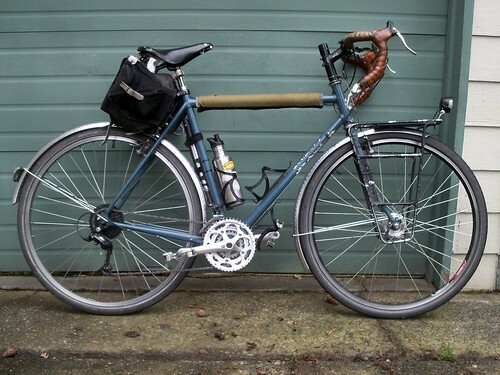 I’m keeping it down to rear saddlebag (Carradice Nelson Longflap) with either small front panniers and/or handlebar bag, depending on my needs. I know you advise using rear panniers vs. front because it’s a bit more aero, but I like putting the stuff in front since the rear wheel takes the most stress and I can see my payload. Thanks for dropping by the site. I’m glad to meet others who thoughtfully ride bikes. Even so, I’m glad to meet anybody on a bike. I only “advise” rear panniers because rear racks are incredibly common and easy to fit. They adequately serve most bikes, and most American bikes are best suited to a small rear load (vs., low-trail Franco stuff). 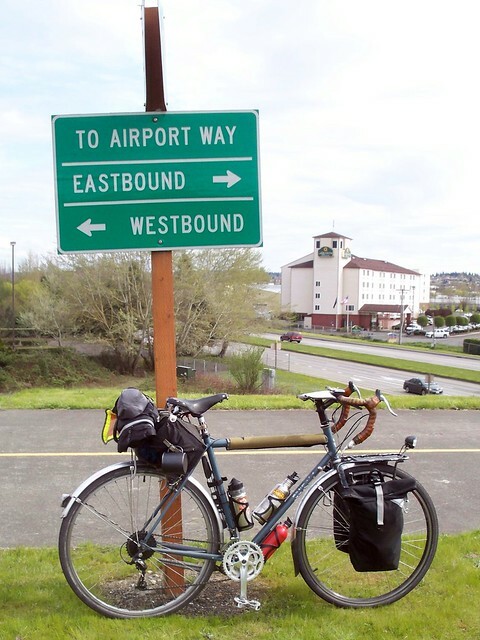 However, one of my favorite touring loads was a vintage Kirtland Handlebar bag with steel support/decaleur, a Jandd lowrider front rack with medium sized Jandd Hurricane panniers (same that Lael still uses), and standard rear rack with two dry bags strapped to it. The dry bags were extremely secure, and the panniers influenced the steering in a positive manner. It has a little heavy, but assured. For non-technical riding it was very enjoyable, like a well-tuned Cadillac. On the same trip, I was using 26×1.75 (559X42mm) Panaracer T-Serv tires. Aside from a few punctures, those tires were some of the best mixed-terrain tires I’ve used, in the vein of the 650B medium volume tires available. Most of the high quality 650b tires are manufactured by Panaracer, and probably share a lot of qualities with the Pasela/T-Serv. Note the tire weight and tread pattern of the Grand Bois 26×1.75 tire. It is exactly equal in size and weight to the 26×1.75 T-Serv. Probably the same tire, with a hefty price tag. A similar tire in 26×2.0 or 2.20 would be great and would eclipse the Big Apple in comfort. Tell me about your LHT. Sounds great. Sure thing! Though rather than bore everyone here, I’ll provide a link to my bikes page where I talk about my Long Haul Trucker and my other bikes. I’m getting a new handlebar bag in the next month and I’ll be using it in conjunction with panniers or by itself, depending on my needs. If I really need the capacity, I can throw the rear rack back on. Nice sketches of the bikes. I’ve got a lot of catching up to do. I love the chainring on the Rudge.